Application hotfixes for Dynamics 365 for Finance and Operations are distributed via AXSCDPPKG (AX Source Code Deployable Package) files. They can be downloaded from the LCS Issue Search page. The deployment process with the help of the SCDPBundleInstall.exe utility is described in this working instruction. Unpack the MicrosoftDynamicsAX_KBxxxxxxx.zip file as downloaded from the LCS. Rename the HotfixPackageBundle.axscdppkg file into a ZIP, unpack it. 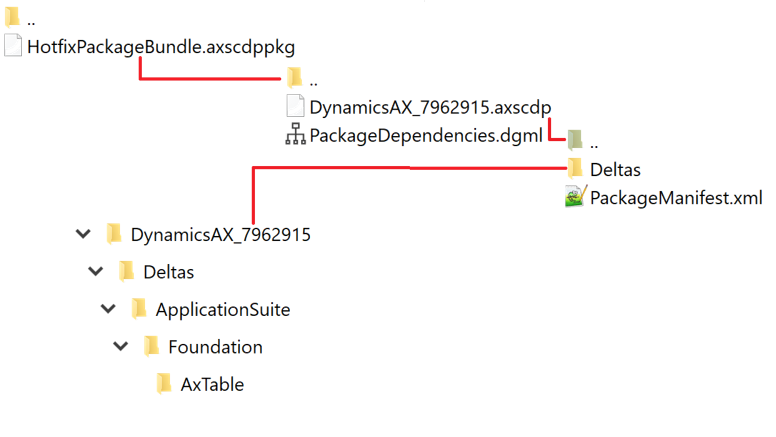 There are at least 2 files inside: one or many (for cumulative hotfixes) nested DynamicsAX_xxxxxxx.axscdp files, and a diagram with their dependencies PackageDependencies.dgml. The dependencies are well described by Mr. de Cavalon in his blog. Rename, unpack the nested DynamicsAX_xxxxxxx.axscdp. There is a set of application folders (Deltas) with a list of all affected application objects in PackageManifest.xml. Traverse the Deltas folder to the bottom. There is an XML file like this with the source code before the update (<Original> … </Original>) and after (<Yours> … </Yours>) in a human readable form, as maintained by the TFS source code versioning system.